Kate Middleton's pregnancy has fueled rumors and speculation across the globe since it was announced in December. But on Monday, the royal baby finally arrived! The Duchess of Cambridge gave birth to a son who weighed 8 lbs., 6 oz. at 4:24 p.m. London time. The big event caused pandemonium on Twitter, and #royalbabyboy immediately began trending as millions commented on the birth of the future king. Not surprisingly, Hollywood had something to say about the royal family's new bundle of joy, too. Messages ranged from the heartfelt to the hilarious. "Glee" star Chris Colfer posted a pic of a stork delivering a baby boy, while funny man Conan O'Brien joked on Facebook that the newborn should "Enjoy these first carefree moments, #‎royalbaby boy, because tomorrow begins THE GAME OF THRONES." HGTV design guru Sabrina Soto kindly offered her services, writing that she's "available to help design the nursery." We can't call her Waitey Katie any more. 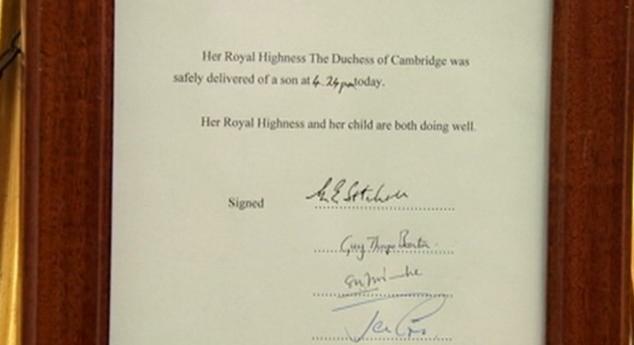 Kate Middleton, the Duchess of Cambridge, "safely delivered" a baby boy Monday at 4:24 p.m. London time. The princely spawn — who henceworth will be known as Baby Cambridge until his name is officially announced — tipped the scales at 8 pounds, 6 ounces. Prince William was by his wife's side during the 10-hour-plus "natural labor" at St. Mary's Hospital. This is the first child for Kate, 31, and William, 31, and the third in line to the throne. "We could not be happier," said the prince in a statement. Kensington Palace also issued a statement regarding the birth. "Her Royal Highness and her child are both doing well and will remain in hospital overnight," said Kensington Palace in an official statement. As for the baby name, it "will be announced in due course." Proud grandpa Prince Charles released his own special message following the big news, saying, "Both my wife and I are overjoyed at the arrival of my first grandchild. It is an incredibly special moment for William and Catherine and we are so thrilled for them on the birth of their baby boy. "Grandparenthood is a unique moment in anyone's life, as countless kind people have told me in recent months, so I am enormously proud and happy to be a grandfather for the first time and we are eagerly looking forward to seeing the baby in the near future." 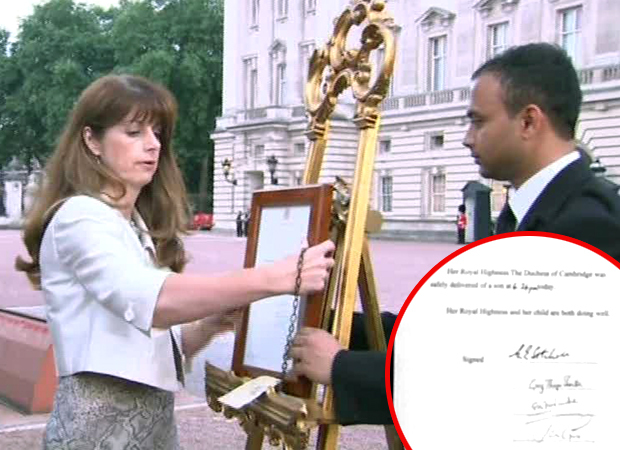 Per tradition, the official framed notification of the birth was placed on a gilded easel in front of Buckingham Palace — the same way William's birth was broadcast to the world three decades ago. It's been an exciting day for royal watchers. Kensington Palace announced to the world media at 11:30 p.m. PT Sunday night — that's 7:30 a.m. Monday morning in London — that Middleton was headed to the hospital in the early stages of labor. "The duchess traveled by car from Kensington Palace to the Lindo Wing at St. Mary's Hospital with The Duke of Cambridge," Clarence House tweeted. While Kate gave birth to a healthy baby boy, she had a rough start to her pregnancy. After confirming Kate Middleton was pregnant on December 3, 2012, she was admitted to King Edward VII Hospital in Central London with hyperemesis gravidarum, or acute morning sickness. Middleton kept her exact due date a secret, simply stating it was mid-July (her last official appearance was on the balcony of Buckingham Palace during a June 15 ceremony). Media started setting up outside St. Mary's Hospital on July 1 in preparation for the Duchess of Cambridge to give birth. The Great Kate Wait continued for over three weeks.